Anthrax Wardance Pale Ale – Brewed by metal heads! 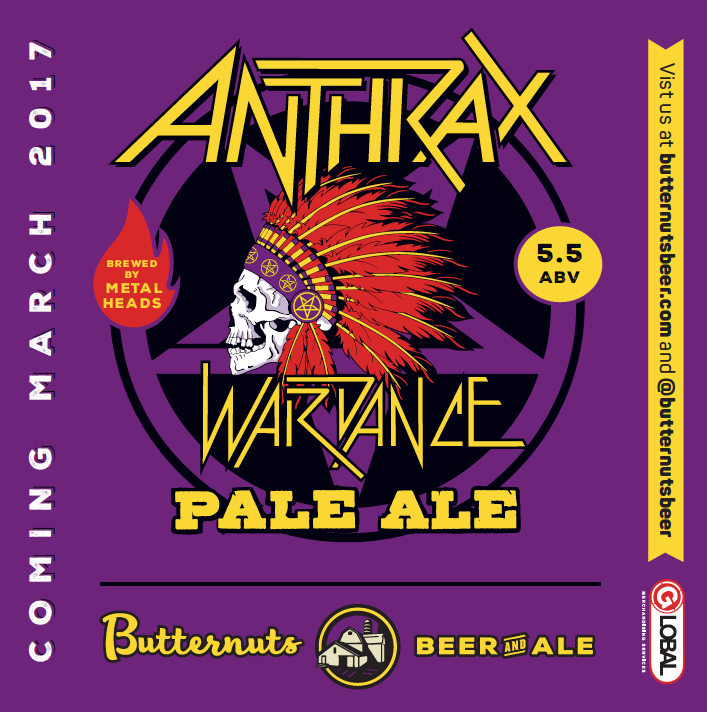 Wardance is a unique and drinkable American Pale Ale, inspired by the thrash metal band Anthrax and brewed by Butternuts Beer. Their music isn’t watered down and neither is this beer. It’s medium-bodied and amber-colored, with rich foam and a bit of bitterness at the end. Like all great things, Anthrax and Wardance are both made in NY. All of us in the band Anthrax are huge fans of craft beer and the craft beer movement. We don’t play watered down music and we don’t like watered down beer. Recently we started talking about how cool it would be if we could have our own Anthrax craft beer? We met Chuck Williamson from Butternuts Beer & Ale. He’s from Queens NY (just like us) and he owns a brewery in upstate NY. We were already fans of his beers and it turns out that he is a huge fan of Anthrax. The seal had been broken and we agreed to make our own brand of beer. We decided to brew a unique and drinkable American Pale Ale. A beer that would have a moderate hop aroma from late kettle hops and dry hopping post fermentation with notes of toasted malts. The beer would be medium bodied, amber in color with rich foam retention and a smooth mildly hop flavored finish with a hint of bitterness on the end. But trying to use words to explain the taste of our new beer is like trying to use words to explain the Anthrax sound. You can’t really experience it until you hear it and feel it. The same is true for our beer, you really need to taste it. Our Pale Ale needed a name. That’s when we discovered that the Butternut Brewery is built on a former Indian hunting grounds. And to this day, local farmers collect Indian arrowheads along the low lands of the Butternut creek. After many names and many beers, we decided to call it “Wardance” A beer rich in heritage, rich in taste and inspired by the thrash metal band Anthrax.